Above, things look slightly different, right? Can you see how the optic nerve looks slightly indistinct, crowded, almost blurry (to the untrained eye)? The above optic nerve is also slightly elevated when you look inside the eye with 3D vision. 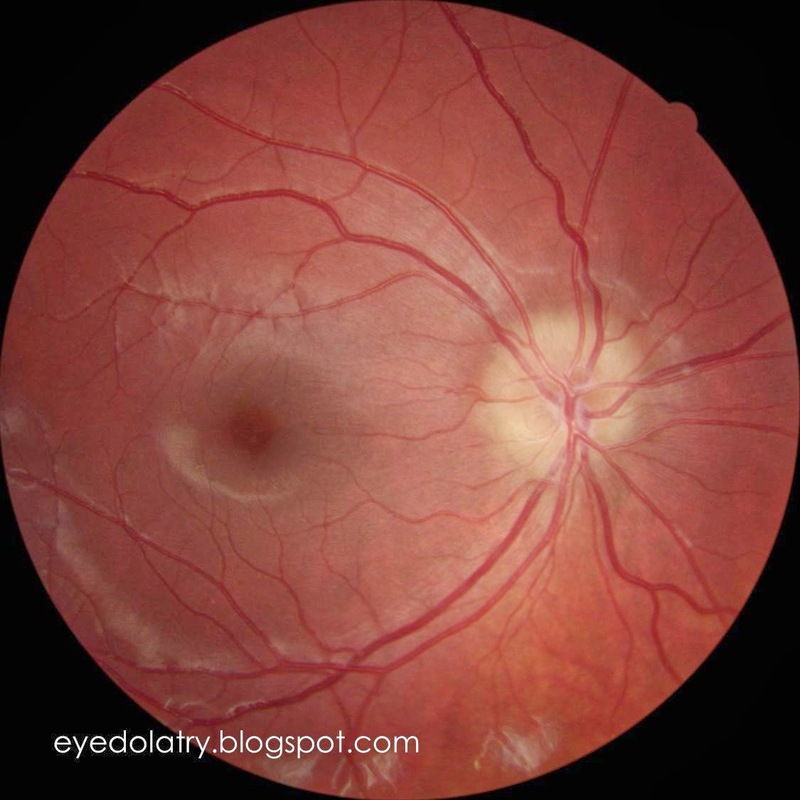 This is a great example of a crowded optic nerve, crowded because there are deposits buried inside the tissue. This picture depicts Buried Optic Nerve Drusen. Drusen are calcified deposits inside the nerve tissue, thought to be remnants of waste or dead cell matter from the nerve's retinal ganglion cells. Studies suggest drusen can be found in about 1% of the population. Typically drusen are asymptomatic, meaning they don't cause any vision side effects. In younger patients, the drusen bodies tend to be buried within the nerve, making them less visible to the doctor upon examination. The earliest age that doctors may start seeing the signs of drusen in the nerve is typically around 12. With age, the drusen will sometimes be pushed towards the optic nerve surface, revealing their distinct, circular shapes. The patient above is in their twenties, so the obvious drusen bodies are buried beneath the surface. You can only see their side effect -- they are pushing the nerve fibers upward, making the nerve look elevated during the eye examination. How do we know if there are Drusen if you can't see them distinctly? The way this nerve appears, slightly elevated, but not actually hazy or swollen is a big tip off. When your doctor sees an elevated optic nerve, they have to decide if it is swollen (papilledema) or not swollen (pseudopapilledema). Blurriness of the nerve is a big indicator of a swollen nerve, but usually a swollen nerve also has bleeding around or nearby making the diagnosis easy. If your doctor is suspicious of a swollen optic nerve, they will likely refer you for an MRI because the big risk of a swollen nerve is a brain tumor. Optic nerve drusen can be verified a number of ways in your eye doctor's office or at a specialist: OCT, CT scan, but the most common way to verify optic nerve drusen is to use a B Scan. 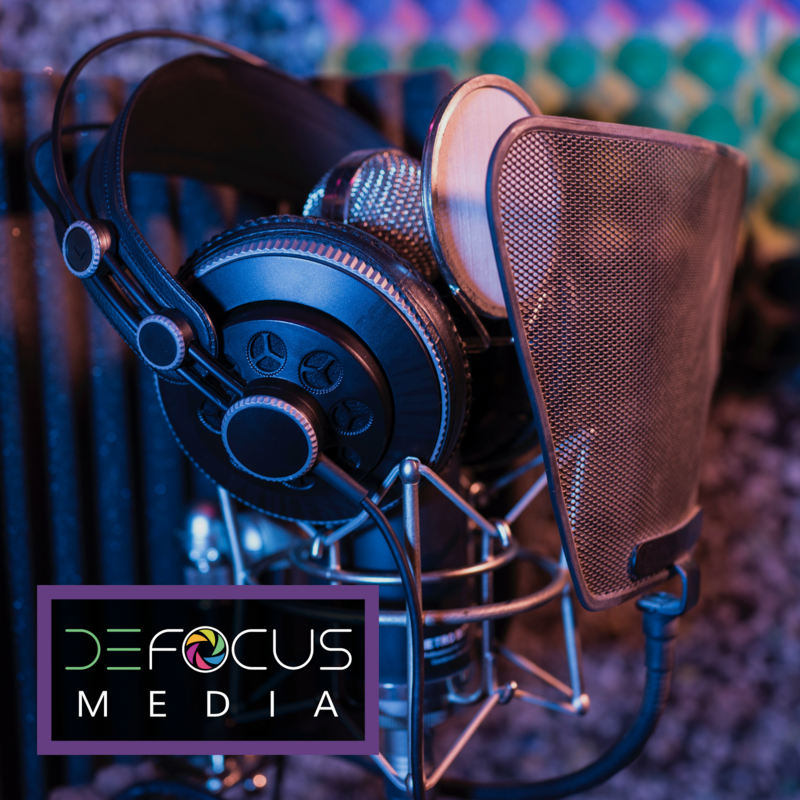 A B Scan is an ultrasound test that is used over top of the patient's closed eyelid, that will show the buried drusen quite distinctly as small reflective particles within the optic nerve. What does Optic Nerve Drusen mean to me? While the data is from small study groups, a reported 60-70% of patients with optic nerve drusen will have changes in their peripheral visual fields throughout the course of their lives. The most common anomaly is an enlarged blind spot. Everyone has a natural blind spot in each eye's vision where the nerve leaves the back of the eye. In people with optic nerve drusen, this spot is usually larger. In most cases the enlargement of the blind spot does not result in symptomatic vision issues, since the brain is programmed to "not see" or not process the blind spot information any way (but it can be fooled into doing so -- click this link if you want to fool yours.) People with exposed drusen have a higher risk of visual field changes than people with buried drusen -- because the deposits are buried deeper in the nerve, they are having less impact on vision. While this high percentage of people with changes on their visual field testing may be scary, keep in mind that this is just changes found on a test. In most cases, patients with optic nerve drusen have no noticeable vision changes in their day to day life. 1) Is the patient's eye pressure within a normal range? People with nerve drusen are more susceptible to damage from high internal ocular pressure (commonly a cause of Glaucoma or optic nerve death). Think of the connection this way: you already have deposits pushing against your nerve tissue inside the eye. If high fluid pressure is pounding against the nerve in the other direction, your nerve fibers are at an even greater risk of suffering damage! 2) Is there any bleeding inside the eye? In rare cases, optic nerve drusen can be associated with bleeding in the eye called a choroidal neovascular membrane. Inject-able treatment of Avastin or Lucentis can be used to stop this bleeding, so if you have been diagnosed with optic nerve drusen, regular eye exams are extremely important even if you have perfect vision. With the eye, most damage to nerve or retinal tissue is irreversible, so if you wait to get treatment after vision loss has occurred, there may be no way to get your vision back. Please see your eye doctor yearly if you have been diagnosed with drusen, so any malicious findings can be found, no matter how rare they may be. Definitely you should see your doctor. What you are describing sounds like an ocular migraine, but you need to have this fully investigated. I'm now 34 and still am baffled by my condition. I have drusen in both eyes. Without knowing your full medical history I can't advise past saying yes, you should definitely see an eye doctor as often as the doctor recommends (whether that's every few months or yearly if your condition is more stable). I was born with an optic disc drusen. I have never had sight in that one eye. Is this something that can be corrected? You should see a doctor to evaluate your specific case! The symptoms you describe are not classic for optic nerve drusen. Visiting a neuro-ophthalmologist or getting MRI imaging can help rule any active inflammation. 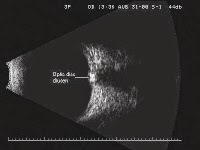 Would you recommend an ophthalmologist over an optometrist when diagnosed with Drusen? Either one! As long as the doctor has the right technology (ultrasound, OCT, and/or fundus autofluorescent imaging) they can confirm the presence of drusen. I was diagnosed about twelve years ago with Optic Nerve Head Drusen, when the drusens began to rise to the surface. Tests show that my peripheral vision is limited, but I also was told that this is the cause of my night blindness and my seemingly limited depth perception. I haven't seen these things mentioned here. Should I be concerned that there might be something else involved? Peripheral vision loss could cause depth perception issues, but definitely if you have worries its best to consult with a doctor who can see your full body of tests and imaging to find any other problems. join the group on Facebook. There we can talk about ODD.